0.0/0.9/1.9/2.9 annual percentage rate financing on new 2019 Camry (Non-Hybrid) with respective terms of 36/48/60/72 months. This offer applies to well-qualified buyers and requires approved credit and financing through Southeast Toyota Finance. Not all buyers will qualify for these rates. Payments may be deferred for the first 90 days; interest accrues from inception. Monthly payment for every $1,000 financed is 0.0% - 36 months = $27.78; 0.9% - 48 months = $21.25; 1.9% - 60 months = $17.54; 2.9% - 72 months = $15.22. No down payment required. $500.00 Bonus Cash on new 2019 Camry (Non-Hybrid) must be used toward purchase. May not be combined with certain other offers. Excludes tax, tag, registration, title and dealer fees. Dealer fees vary by dealer. Must complete retail sale and take delivery between 04/02/19 and 04/30/19. $219.00 per month for 36 months. $3,737.00 due at lease signing. Excludes registration, tax, title and license. Offer Details Lease a new Camry LE Model 2532: $219.00 / for 36 Months / with $3,737.00 DUE AT SIGNING. Amount due at signing includes DOWN PAYMENT of $3,518.00 and FIRST MONTHLY PAYMENT of $219.00. LEASE END PURCHASE OPTION is $0.00 plus tax, title and license. Customer is responsible for disposition, excess wear and tear fees and $.18 per mile over 12000 miles each year. Dealer participation may affect final negotiated price and applicable taxes. Monthly payment may vary depending on final price of vehicle and your qualifications. Must take delivery from dealer stock. Dealer sets final price. Offer valid 2019-04-02 through 2019-04-30. See dealer for vehicle and lease program details. Drivers should always be responsible for their own safe driving. Please always pay attention to your surroundings and drive safely. Depending on the conditions of roads, vehicles, and weather, etc., the system(s) may not work as intended. See Owners Manual for details. Security deposit required with exception of prior Southeast Toyota Finance (STFS) financing history and/or STFS tier rating in which a security deposit may be waived. For well-qualified lessees with approved credit through Southeast Toyota Finance. Not all lessees will qualify for this payment amount. 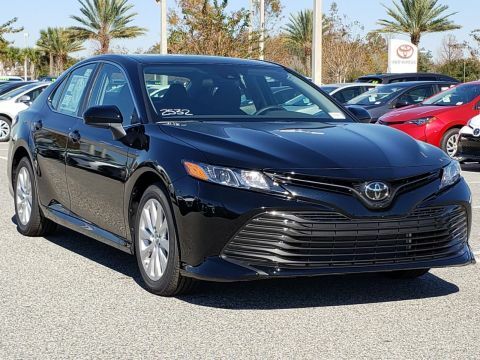 Closed-end lease on new 2019 Camry LE (Non-Hybrid) model # 2532 with automatic transmission and select equipment. Adding options increases payment. $219.00 per month for 36 months. $3,518 due at signing includes $3,299 down payment and first month's payment. No security deposit required. $21,830 Adjusted Capitalized Cost is based on down payment; excludes tax, tag, registration, title and dealer fees. Dealer fees vary by dealer. Monthly payments do not include applicable taxes. Lessee pays the remainder of maintenance after ToyotaCare expires, excess wear and use, and $0.18 per mile over 12,000 miles per year. Lease payments total $7,884. Disposition Fee of $350 due at lease-end. May not be combined with certain other offers. Must take delivery between 04/02/19 and 04/30/19.